You have come to the right place if you are looking for fun, engaging and exciting Pirate themed activities to do with toddlers, preschoolers and kindergartners. Our activities are widely used by teachers, moms, dads, child care providers and more! Take small white plastic kitchen bags and cut out squares. Staple black construction paper cross bones and “skull” to them. Staple to kitchen straws. Set out baby food jars, vegetable oil, water and food coloring. Let each of the children fill one of the baby food jars halfway with water and add two or three drops of food coloring. Fill each child’s jar to the top with the oil. Screw the lid on tightly. If necessary, seal the lid with hot glue and allow it to cool. Let the children shake their wave jars back and forth to create waves. 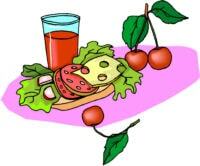 Provide paper lunch bags for the children to decorate with glitter and gold paint. Help them write “Trevor’s Treasures”. The children can use them at the end of the week to take their loot home with them in or to store their gold rocks from the Sandbox Treasure art project. Make little pirate boats out of a 1/2 a walnut shell. Insert Plasticine in the bottom then attach a toothpick with a little paper sail. You can have pirate ship races. Get a trunk if possible, or use a box painted with skull and crossbones. Add in a lot of play sand, and “bury” little dime-store treasures for kids to find. Make up treasure bags with crossbones on them for the kids to put the “treasures” in. Have another box of sand with “sea shore” finds – gather shells and seaweeds to put in the box of sand. Place several pillows around a large open area. Tell your children they are islands. Have the children hop from island to island without falling in the water. Make up stories about pirates and alligators while playing. Cut circles from cardboard. Wrap each circle in aluminum foil to represent coins. To Play – Hide the coins around the party area. To begin the game, announce that another group of Pirates snuck onto the ship and has stolen all of our treasure. We must all look for and rescue our treasure. We have learned about feet, inches, centimeters and meters. I divided the class into groups of 2 -3 “pirates” and gave each group a specific number (eg. 5 inches) to measure around the room. Each group had to search the room for objects of that length and record what they found…they measured pencils, desks, classmate’s feet, big books, words on the word wall…anything they could find! After a certain amount of time, I had all of my pirates return to their “ship” (desk) and create a poster of a treasure chest. Inside the lid, it says the measurement they were searching for. In the treasure chest, they drew pictures of the objects they found. They then shared their posters with the class. We hide the items in the area beforehand then the kids are given a list of what to find. Give the kids an allotted time to find as many items on the list. Materials rocks white glue powder paint sequins glitter. Children paint their rocks with the paint (white glue mixed with powder paint). Then they stick on the sequins and glitter to make their pirate treasure. Make a treasure hunt around the house or garden to find hidden chocolate coins. Before children arrive, wrap goodies in gold foil or wrapping paper. Hide them around the house. At a given signal, the children can hunt for the hidden treasure and place it in their treasure chests or a “loot” bag of some kind. Perth, Western Australia, the Historic Boats Museum in Fremantle has a wonderful preschool program centered around pirates. · Bandannas – Cut out square pieces of red cotton, polka dotted or plain & tie around the children’s head. · Belts – Cut large strips of black cotton to make the belts to tie around their waists. · Eye patches – Cut out eye patches from black cardboard and fasten rubber bands onto them and put over one eye. · Mustaches – Give each child a black eye-liner pencil and provide a mirror for them to draw a mustache on their face. 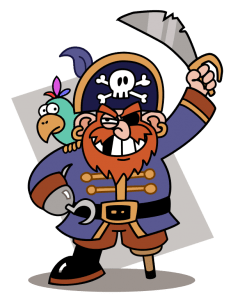 · Pirate Name – What’s a pirate without a great pirate name? Provide them with buttons to write a name on and pin it on their clothing. · Buccaneer hats – fold a sheet of tissue into a 20×15 inch rectangle. Now fold the rectangle into a 10×15 inch rec., with the major fold at the top. Fold the corners of each top side down 7 inches and crease. There should be about a 1 inch space at the top. Fold bottom on each side up 1-1/2 inches. Crease. Fold up 1-1/2 inches again and crease. Turn hat over and repeat on the other side. Staple hat together at edges. On the right side of hat, slightly off center, staple a feather behind the cuff or brim. Stick a gold seal over the staple. · Hooks – Draw a hook on cardboard, cut it out and insert it in the bottom of a Styrofoam cup. The kids then insert there hand and it looks like a Pirate’s Hook Hand. 3. · Get earrings from Mom that are clip-ons. · Add a red kerchief from the dime store and make an instant “scurvy swabbie”. · Use instant tattoos to create real swashbucklers. · If possible, get white t-shirts, and using reb/black fabric paint or shoeshine applicators, paint stripes on them. Be sure beforehand that no children have allergies to seafood.This could be fatal to a child who is allergic to fish. Shape like a desert island. You can get little Lego sets or Playmobil sets with cute little pirate items that could be used as decorations on the cake. Make the boats from halved bread rolls covered with peanut butter, with paper sails on cocktail sticks.